The heads of some of the world's biggest oil companies have tried to distance themselves from their British rival BP and its disastrous Gulf of Mexico oil spill at a hearing in Washington. 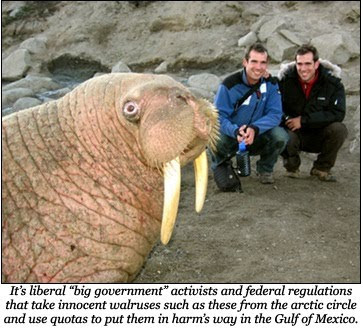 And ExxonMobil in particular was ridiculed for including plans to deal with walruses — an animal whose range is confined to the Arctic — in its plans for a Gulf of Mexico oil spill. At a time when public anger with BP is sky-high due to a catastrophic oil spill caused by cutting corners and lack of preparation for an emergency, ExxonMobil, one of the most powerful companies on the planet, showed up to a hearing by the country's legislators to demonstrate their preparedness for a disaster with plans for dealing with walruses in the Gulf of Mexico. How does an executive show up to a Congressional hearing to assure legislators that his company would do a better job at deep-water drilling than a company that has let oil spew into the ocean to the tune of 100,000 barrels a day, for 50 days, and not even have a single check along the way to ensure that his plan actually makes sense? How can it be presented as something that wasn't slapped together haphazardly at the last moment yet have the presenter face zero consequence? It's like a college student excelling in a course to the point where the final exam can be skipped, knowing that although the grade might drop a bit, it still won't result in any meaningful long-term change. Or short-term. Also, success for the college student doesn't involve slow, systematic destruction of the Earth. 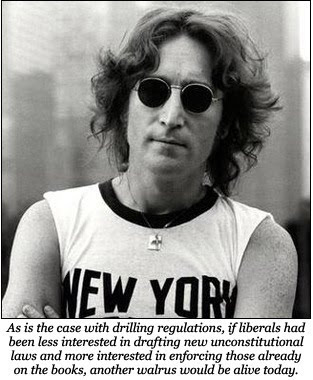 It's easy to dismiss as hoary liberal cliché — the sort of thing people who read Chomsky like to tell strangers in public — but if the lion's share of American legislators weren't in the pockets of energy corporations, depending on corporate largesse to fill campaign coffers, ExxonMobil would be denied any kind of permit for drilling until they could conclusively and thoroughly demonstrate some serious effort on their part to ensure maximum project safety. But we do have those kinds of legislators, which is why we still have offshore drilling. And plans for walruses. Public relations are complex, and one would imagine much documentation would be necessary to supply handy, detailed answers to placate the vacant-faced villagers who'll be all too happy to accept any answer short of, "We only cared about profit, and safety measures are expensive to implement." There is zero chance that public relations are more complex than containing a gigantic deep-water oil spill — let alone more complex by a factor of four. ExxonMobil willingly provided evidence that it spent more time developing plans to protect the company's image in the event of a disaster than it did about protecting the environment. This alone should be more than sufficient grounds for denying them any type of offshore drilling permits, or for revoking their corporate charter. But then Congress would have to revoke the corporate charter for all oil companies present at the hearing, for that exact same reasoning. Congressman Ed Markey ridiculed ExxonMobil and the others for having almost identical contingency plans for the Gulf of Mexico. That these companies don't care is painfully obvious, but more disturbing is that they take no trouble to conceal it, since they're well aware that they'll suffer no penalties. Hey, free markets and all that. The oil disaster has caused great economic impact to my district. Hundreds of businesses have closed, thousands are out of work. Mr Stearns [Rep. Cliff Stearns, R-FL] asked Mr. McKay to resign. Well, in the Asian culture we do things differently. During the Samurai days, we would give you a knife and ask you to commit harakiri. Cao is from Louisiana, so it's not like this is both crass and out of nowhere. He's clearly joking, but this not only a Republican being mean to a business executive, it's really mean. Cao said that the afternoon of the hearings, and the next morning it was already buried on FireDogLake's frontpage, which represented most of its media coverage anywhere. It received precisely zero coverage in the "mainstream" media, and anyone unfamiliar with FDL's frontpage would never have learned about it. Take a moment to consider what would happen if a Democrat had uttered that comment instead of Cao*. The media would absolutely explode. The conservative siren song about electing far-left Democrats to legislative positions would be belted at top volume — because they hate business, and they want to kill American prosperity, and this is proof, and has he resigned yet? * — Cao was the only House Republican to vote for the first iteration of the HCR bill and, later, the recipient of vicious hatred from the American right because of it. (He later voted against the final version of the bill.) Some actual news outlets ran stories about the reaction he received, either online at places like Twitter and Facebook or in real life. Asian Pacific Americans for Progress even sent House Republican Leader John Boehner (R-OH) a letter demanding he denounce the racist attacks on Cao coming from the conservative Internet community; FreeRepublic is the only website referred to by name. On that website, one of the earliest threads about his vote included two jokes about deporting him within the first six posts, and Apocalypse Now references popped up, along with other great comments. Some not included in that link but are worthy of attention include: "That is no reason to let a covert Viet Cong like Cao off the hook." "VC sleeper agent? Had plenty of them before the Tet offensive." "Three years in Nam, fighting for the freedom of the South Vietnamese and here we have one voting for Communism in MY country! CAO my A$$" There was also some kind of comment about exchanging "pieces of lead" for his vote instead of "pieces of gold" but moderators smartly deleted it. In short: conservatives don't like him a bit. He's completely fallen off the radar since then, which isn't difficult to achieve when you're among roughly 175 other people who usually vote as a bloc. The thundering inattention Cao's comments received perfectly illustrates old media's disinclination or disinterest in holding Republicans accountable for truly shocking words, whereas the slightest of Democratic slip-ups get pounced on, made into a scandal and never forgotten. Sure, big things are worthy of big disapproval. John Edwards was instantly disowned by the entire Democratic party, and his home state hates him because of the revelation of his affair; meanwhile, numerous confirmed adulterous Republicans currently holding office are due to win re-election this November. PPP's Tom Jensen has noticed this, with solid numbers to back it up. In fact, Republicans are so damn efficient at uncovering non-scandals that only happen in Democratic administrations that they want to double the staff of the House Oversight and Government Reform Committee once they win in November, for the main purpose of investigating President Obama because of — well, pick something imaginary and run with it. Every single imaginary thing will hit the news, none of them being newsworthy. Or scandalous. Or interesting, unless you're watching FOX to see how long it takes for Sean Hannity to break a story on how Portuguese Water Dog Bo "Omar al-Bashir" Obama was purchased from a child in an alleyway located in an Eastern country, under the conditions that he won't be exposed to bright light, get wet, or fed after midnight, lest he go to town on what's left of the Constitution. And while Barton's outburst and subsequent apology — without any explanation as to why his opinion did a dizzying 180 — might have gotten him some temporary bad press, the complete and total lack of a Democratic Congressional representative with the guts to call for nationalizing BP's assets shifts the conversation about this disaster firmly to the right, putting the liberal response on record as, "This guy is being mean. Please make him retract his statement without saying why he's doing it." It's doubtful many Americans would begrudge Cao his outrage at unaccountable private entities despoiling public lands and handing the public the liability for any unforeseen costs. What can be begrudged, however, is the privilege he has, as a member of his party, to engage in this kind of "tough talk," while any member of the opposition would be unfairly demonized for advocating the authoritarian overreach of a centralized power determined to annihilate liberty and commerce.